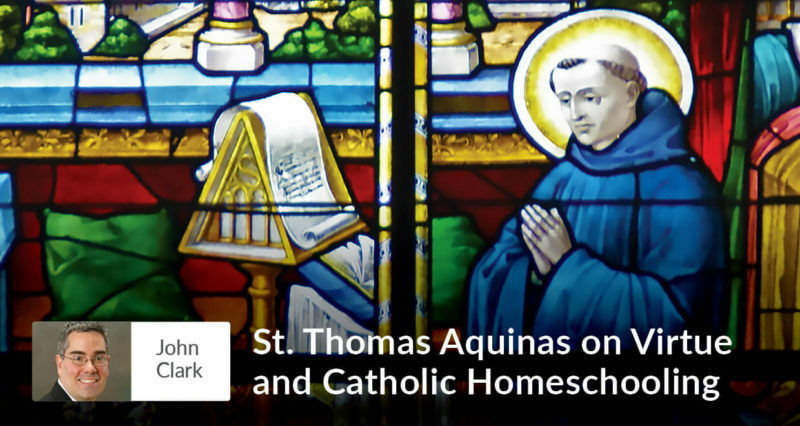 Saint Thomas’ words come from the Summa’s section on Perseverance, and although Saint Thomas wasn’t trying to formulate a definition of homeschooling, “persisting in a great good until it is accomplished” sums it up pretty well. As for its virtuous nature, we might say that homeschooling is not only about “the difficult and the good” but that it is about the very difficult and very good. For that reason, we might rightfully claim that homeschooling constitutes a special virtue. Homeschooling is difficult. It’s difficult for lots of reasons, including the facts that, due to the Fall of Adam, our intellects are darkened and our wills are weak. Those difficulties apply to both parents and children. The Fall helps explain why it takes two hours for your son to finish his Geometry homework and why it’s more fun to watch The A-Team than reading your daughter’s Pride and Prejudice book report. It also helps explain why, even though each of us has a learning difficulty, learning is particularly difficult for some of us. When a father teaches his son Algebra, the process involves two people with dimmed intellects who would often rather be watching The A-Team together. It’s pretty tricky. And everything I just outlined radically understates how difficult homeschooling can be for many families: there can be financial struggles, criticisms from outside family members, a heightened level of exhaustion, and a lingering sense of self-doubt. For many families, perhaps for most, homeschooling is the toughest thing they will ever do, by far. Given all that, you might ask: Why in the world would I want to homeschool? You wouldn’t be the first to ask that question. But consider this: That same question could be applied to any of the virtues. For instance, justice, temperance, charity, chastity, and truthfulness have their downsides, too. Why would you want to practice these virtues, either? Here’s where Thomas and Aristotle come to the rescue and answer that question for us. Thomas credits Aristotle with seeing that virtue is “about the difficult,” but Aristotle also saw something else: performing virtue makes us happy. That’s how God made us. In time, homeschooling—like all virtues—fulfills our nature. You may not recognize that fully today or even tomorrow. But you will arrive at that happiness and fulfillment. Homeschooling is good. Catholic homeschooling is directed toward God, front and center. Sometimes, with all its difficulties, we can forget that it’s good; but when you have these difficulties, recognize its goodness. If you talk to a homeschool veteran who has been homeschooling for years, many will admit that they thought about quitting, but they stayed on track because they saw the value in what they were doing. They understood that what they were doing was vital and virtuous. When it comes to staying on track throughout the homeschool year, it is not going to be the great organization that helps you when times get tough. It is going to be the fact that God is offering you the grace to persevere, and that you are accepting that grace. By all means, help your children get back on the academic track; help them get everything clicking. But please remember that the content of their knowledge is much more important than the mere volume of knowledge. When it comes to staying on track in homeschooling, always remember this: It’s your track.